1952’s film noir thriller from director David Miller stars Joan Crawford as heiress and successful San Francisco playwright Myra Hudson who meets and falls in love with the suave Lester Blaine (Jack Palance) while casting her next play. The two get married after a whirlwhind romance, but little does Myra know that the conniving Lester is still married and still seeing his equally conniving and avaricious mistress Irene Neves (Gloria Grahame). While dictating her updated will in her study one night, Myra overhears Lester and Irene plotting to kill her, not knowing they were being recorded by her dictating machine. 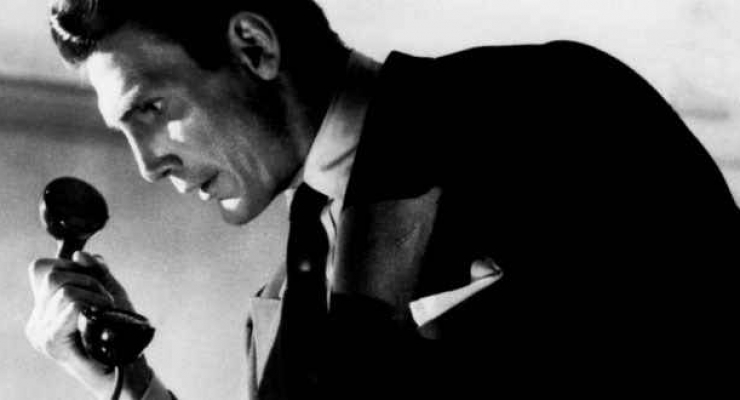 Queue cinematographer Charles B. Lang Jr.’s lush and stark film noir shadows, David Miller’s quickened pacing and references to clocks, and Joan Crawford’s often melodramatic but still formidable performance as first Myra withers in fear, but then begins to plot her revenge on Lester and Irene as she turns the tables on them. The third act is a suspenseful chase through the nighttime streets of San Francisco draped in shadows, Myra having thoughts of murder on her mind before she comes to her senses, and a spectacular dramatic ending that sees the original plotters get their due. Joan Crawford garnered an Academy Award nomination for Best Actress her role in Sudden Fear, Charles B. Lang Jr. a nomination for cinematography, and Jack Palance a Best Supporting Actor nomination for his devilish portrayal as the murderous rapscallion Lester Blaine. 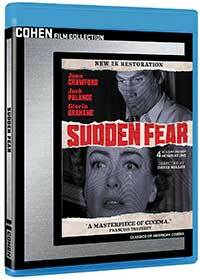 Sudden Fear comes to Blu-ray in a new 2K restoration encoded in AVC 1080p, its original 1.37:1 framing intact. While it has certainly been cleaned up, the grain structure does look a bit thick and black levels waver a bit. We don’t get a consistently crisp look without flutter and wonderfully inky blacks. That said, the image looks organic, shows no noise or smoothing over and is pleasing in the end. The monaural soundtrack is offered up in what sounds like a quite cleaned up and robust LPCM 2.0 track. The pulsing and manic score from Elmer Bernstein really shines through with excellent dynamics despite the limitations of the times and the lack of additional channels. Dialogue is intelligible and the sound is clean enough. There isn’t much on offer here outside of the excellent and informed audio commentary from film historian Jeremy Arnold. The theatrical trailer is a nice bonus, but certainly not a must-have option. The included, thin booklet has nothing beyond cast and crew credits and a few still images. Given its propensity for melodrama and its slow opening, Sudden Fear doesn’t quite reach the level of some of the more well-known film noir films around its era like The Asphalt Jungle, Vertigo, or The Third Man, but the manic, high intensity thrills of the third act keep you on the edge of the seat and the brilliant cinematography of Charles B. Lang Jr. only serves to heighten the tension. This is a film ripe for rediscovery and Cohen Film Collection offer it up in a satisfying restoration on Blu-ray. A suspenseful film noir that finds Joan Crawford at her melodramatic best. It's pacing is slow at first, but picks up in the second half aided by magnificent cinematography.